Are you looking for a fogger mist maker to create a magical atmosphere and add great effects to your pond or swimming pool? -- AGPtEK Mist Maker Fog Maker would be your best choice! The AGPtek Patent Product--Mist Maker/Mist Generator, using ultrasonic electronic technology to make the water molecules into fog molecules. Perfects for being used in your pond, botanical garden, ecotron, rockery, fishtank, vase, pool.,etc. It will create a magical atmosphere. DO not harmful to any animals. ----our product’s output voltage is 24V so it’s safe to used in the water. Just using your imagination and you will find a lot of fun when use this mist generator. Don\'t touch the atomizing slice while the mist maker is working. The ultrasonic frequency exceeds the human body’s frequency range, so your finger may feel numbs if you touch, but please know that its Not Electric Leakage. our product’s voltage is 24V so it’s safe to used in the water. 2. 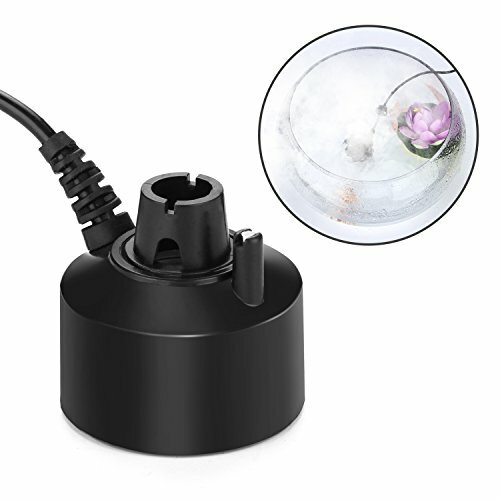 The Atomization Disc is Consumables and its service life is ≥3000 hours, so please keep the water clear and do not drop any essential oil in when using; (water quality deterioration may influence the lifetime). 4:Please ensure that the daily running time is less than 6 hours, otherwise the life of atomizing slice will be shorted. 5. It can only be used in tap water do not use Distilled Water. 6:In order to prevent water from spilling out when using, PLEASE PUT IT INTO a large or deep container. As a safety precaution, PLEASE DO NOT put any electric appliance near this item. AGPtEK cool mist humidifier continuously comes with new products and promises to make the products durable with the highest quality. This AGPTEK air humidifier are 100% brand new and of great quality. No heat or chemicals should be used in this led fog machine. This fogger is easy to operate, put this water mister in the water and the voltage is 24V, and then the mist appears. AGPtEK cool mist make is ideal for indoor or outdoor fountains, water feature, and office use. This fog maker creates a soothing, natural layer of fogging mist above water surface.